A spa added to the home will give many great benefits to the homeowner. They can help to make the pool area complete if one is installed in this area, and offer so many great health benefits. 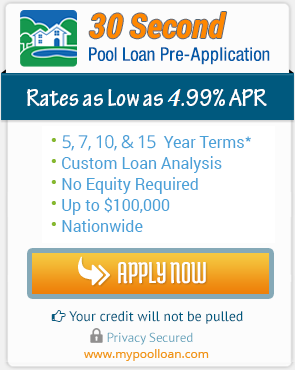 Right now is a great time to finance a spa for the pool or the home due to the many benefits that they have to offer. There are many health benefits with a spa that homeowners may not be fully aware of. Sitting in a spa can help to reduce muscle and joint pain. It can do this by increasing the blood flow, which will help repair any damage to the area by bringing back nutrients that have been lost. Those with arthritis can greatly benefit with daily soaks in a hot tub or spa. A spa will give not only a massage to those that suffer from arthritis but the use of hydrotherapy will also soothe the area with moist heat. Diabetes can also be controlled with the use of a spa. Diabetes patients can lower their blood sugar levels, as well as blood pressure. A study found that if a patient soaks for half an hour, 6 days out of the week, they can lower the blood sugar level by an average of 13%. Those who have trouble sleeping, get frequent headaches or migraines, and have a life full of stress will find that a spa is the right choice for them. Stress can be reduced in a natural way by soaking in a spa because the warm water will release the endorphins that make the body feel good. The warm temperature will soothe the entire body, a must for melting the stress away. Blood vessels can become dilated when a person soaks in warm water, so this can help to ease headaches and migraines. This can also soothe the entire body, relieving pressure on nerves . And a much deeper sleep can be had if a person soaks for a few minutes in a spa before bedtime. Spas are a great way for athletes to recover from any injury. They help to rejuvenate the muscles, which can become pulled or strained when an athlete works out hard. Sitting in a spa on a regular basis will help an athlete recover faster. There are even some models that offer back massaging while sitting in the warm water. All parts of the body can be treated with one simple soak. An athlete may also decide to soak before a workout to loosen the muscles, and relax the entire body. This will make the exercising more productive and decrease the risk for injury. Spas are also great for heart patients. It was once thought that hot tubs should not be used if a person has cardiovascular issues, but recent studies have found that the opposite is true. Sitting in a spa will increase the heart rate, which will lower blood pressure. This means that there is less stress to the heart, and can have the same health benefits of exercise. One of the best ways that a couple can get closer to each other is sitting in a spa at night. This will allow them to not only relax and unwind, but spend some quality time together as well. Lighting a few candles can set the mood, and there will be sure to be many laughs, creating a peaceful moment between the two. They are also great for a family because it is easy to unwind in the spa after the parents have been away at work, and the children have been in school or daycare. Soaking in a hot tub can allow parents quality time with the children, asking them how their day was. In today’s busy world, there is not a lot of free time for families to do this, but with the help of a spa or hot tub, a family will be able to manage the time to soak their cares away. Spas can be added anywhere in the home. They can be used indoors or outdoors, by the pool or on a deck. They can be added to the bathroom in the form of a walk in tub. These types of tubs are perfect for the elderly that have a fear of falling from stepping into a tub or spa. They feature a low step with a leak proof door that allows the tub to fill up with warm water, and jets that can be turned on for a spa like effect. Adding a spa to the home can be a great way to escape the real world, even if it is only for a short time each day. They are a great way to relax, and are perfect for the entire family. The mood can be set with soothing music or candles, and they can be enjoyed any time of the year. Adding a spa to the home will be the perfect way to add peace to your daily life, as well as add some value to the home.